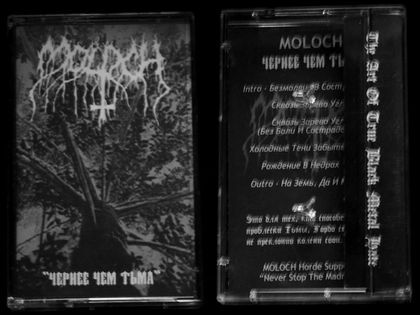 First official demo Moloch. 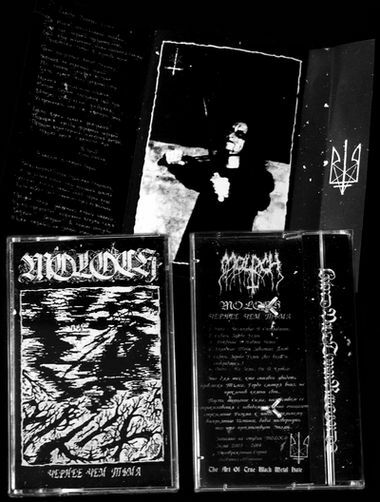 Recorded with help of two spirits somewhere in the dungeons of Rivne and Moloch studio (Ukraine) on two-inch tape recorder between dismal Winter 2003 - 2004. Sergiy Fjordsson (all instruments and vocals) and Unholy Tatiana (second background screams on tracks 2 & 5). This was the first and last recording for Unholy Tatiana. Mixsed with two cassette recorders and old microphones somewhere in the depths of darkness during few nights. This is edition of After Many Funerals Productions (run by Alexander Ivanov (Aryan Art). Printed in 2004. Limitation unknown, but i think this was something around 400 copies (Catalogue number: A.M.F. 18). 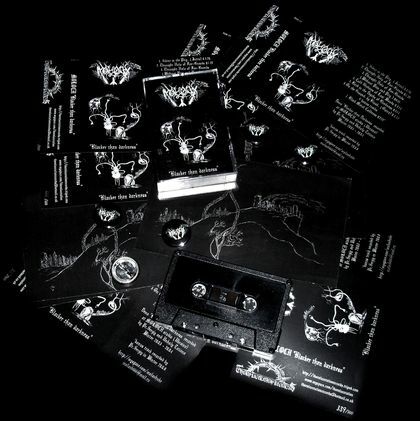 Cassette with black/white 2 sided pro-cover and small tape stickers. Front cover photo was made by Sergiy Fjordsson near a cemetery of Rivne. This is edition of Осолонь (Russia). 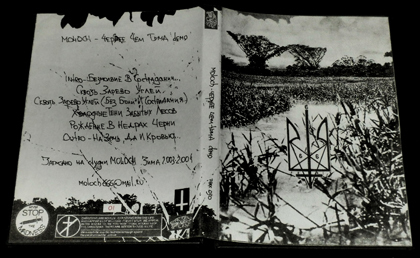 Limited to 500 copies (Catalogue number: осолонь 06) with almost the same cover art. 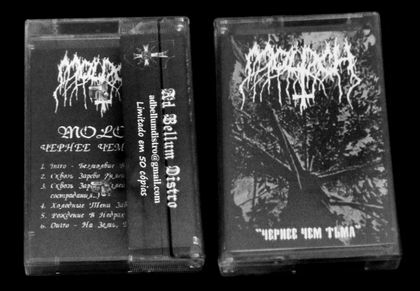 This is Promo Tape edition printed via my own De Profundis Productions (Ukraine). 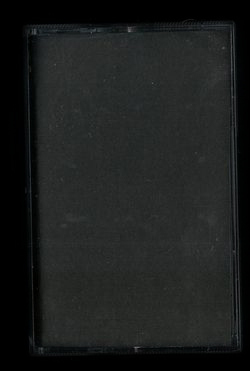 Cassette limited to 66 copies with minimalistic, totally black cover without any info. The reason for this cover is basically for people to just get into the music without examining what the symbolism behind the cover represents. Almost all copies were spread in various wolrdwide trades or given personally. This is edition of Unholy War Productions (Brazil). Printed in 2007. This was the first label release (Catalogue number are U.W. 001). Limited edition 1000 (or 500?) copies with 2 sided black/white pro-cover. This tape has English title "Blacker than darkness" and english track list. This is Promo CDR edition printed also via my own De Profundis Productions (Ukraine) in 2007 and were spread in various worldwide trades for free. Catalogue number: Прах 030. Limited to 50 copies in dvd case with one sided black/white xeroxed cover inlay (xerox was made from original cut-and-paste template made by Sergiy Fjordsson). Front cover has a symbol which is a mixture of Ukrainian coat of arms "Trident", inverted cross and pentagram, done by sergiy Fjordsson. This is edition of Thorn Laceration Records from United Kingdom. Printed in 2009. Catalogue number: TLR021. Limited to 500 copies with black/white 2 sided pro-cover. First 50 copies comes with 1'inch logo pin. This edition included bonus track: "Black Metal Coldness" (02:52). 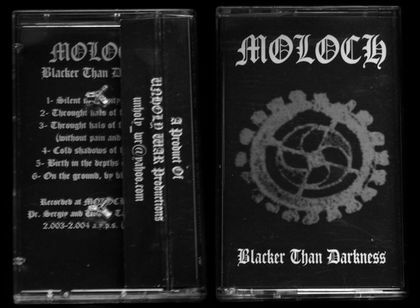 This tape also has english title "Blacker than darkness" and english track list. All drawings used in the booklet were made by Sergiy Fjordsson between rotten Summer - Autumn 2008. This is the first official CDR edition of this demo. Made in 2013 as cooperation between 2 labels: Glorious North Productions (U.K.) & Depressive Illusions Records (Ukraine). Catalogue numbers: North 001 / cut 823. CDR in jewel case with 4 pages black/white booklet. Limited edition to 51 copies only. This is edition of Ad Bellum Distro (Brasil). Printed in 2013. Limited to 50 copies with one sides printed covers. 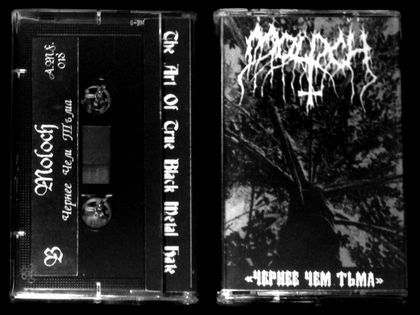 Сover design is the same as on the edition of After Many Funerals Productions, but one sided. First official pro CD edition of this demo. Pressed in 2013 as cooperation between 2 labels: S.A.Music (Japan) / Depressive Illusions Records (Ukraine). First press limited to 500 copies with pit art and 4 pages black/white booklet. This was the first CD release for Depressive Illusions Records. (Matrix code: Чернее Чем Тьма; Cat-number: SAM02 / cut 1250; Mould SID Code: IFPI UAMO8). This is new cassette edition of Lánd-Væt-Turr Records. Printed in 2017 and limited to 614 copies (99 for Greenland/Iceland territory and rest for the world). Standart casette with 2 sided b/w pro-cover. Catalogue number: TAPE-006. Cover art designed with hand-written lyrics, unpublished old photo and original unpublished front cover art (both made in 2000). Digital version of this demo officially distributed via Moloch bandcamp page and Glorious North Productions bandcamp page only. No vinyl edition of this album at the moment. But one track can be find on Moloch / Nunslaughter (but with german title " Ausklang - Am Boden und im Blute..."). Cover version of the song "Cold Shadows of the Lost Woods" can be find on the FUNERAL TORMENTLY demo "Nostalgia... (Compilation)" and cover song "Сквозь зарево углей" can be found on the ВИСЕЛЬНИК demo "Despair". проблески тьмы в лунной ночи. где то храня свою древнюю суть. мигом одним обозначив свой путь. устремилась она на извечную земь. с собою унося святости дух. The glimpses of darkness in the moonlit night. Keeping its ancient essence hidden somewhere. It has rushed towards the ancient ground. Devouring the crosses of the wooden churches. Taking the spirit of holiness away. уходят вглубь, навеки чтобы чернь жила. чтобы обратно на землю упали они. To let the blackness live forever. So they would fall back to the ground.